Yard saleing. Thrifting. Going to Goodwill. Call it what you will, you’re getting either a great deal, or someone else’s gross old cast-offs, depending on how you look at it. 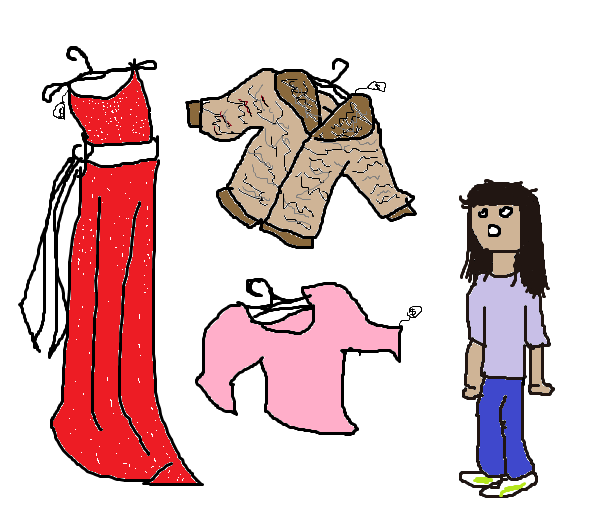 I have fond memories of browsing a somewhat upscale consignment/resale shop with my mom. When my siblings and I were kids, we’d go there to do some clothes shopping. It was less expensive than going to the mall, and I thought it was a magical land of gleaming dresses, shimmering, soft Christmas sweaters, and rabbit-fur coats. That perception set me up for a lifetime of disappointment in visiting other thrift stores, I’m afraid. As a grown-up, when I got my first desk job ten years ago, I made the trip to the store, which had moved to a smaller location, to find some business casual clothing. I found the store cramped, the selection not as thrilling (like looking for a needle in a haystack), and the frustration at not being able to find something in my size pretty high. I still remember being happy with the two pair of slacks and the light blazer I picked up for, all told, $25. Goods from the magical thrift store of my youth always seemed so glamorous and beautiful…and cheap! And then, I’ve been to two thrift store changing rooms in the past two months that have smelled of urine. Yeah, no wonder some people still look down on it. The sad reality of my latest shopping trips. Maybe I just lucked out in getting two dressing rooms at -two- separate locations that people had recently used as a bathroom. I’m down from 203 in March 2011 to around 167 at the beginning of June 2012. Started at U.S. pants size 18, currently down to size 12. I haven’t been here long, but I could get used to it real quick; it’s nice to be back in a size I haven’t seen much of since I was an eighth grader. My personal pants collection was culled last week. There’s a stack of slacks and jeans in storage, just in case I yo-yo and put the weight back on (you never know), some of them size 16, a few of them size 14. I got down to three pairs of jeans this week, and one of them is still ill-fitting enough that I need a belt to wear them again – and I didn’t even have one of those, since my old belts are now too big. Normally, this would be cause for celebration and a shopping trip. Yeah, I’m losing weight! Let’s celebrate with participating in capitalism! However, my personal finances being what they are, I’m not really solvent enough to go buy too many new things. You could say I’m as broke as Greece. I’m as broke as Iceland. I’m as broke as I was until I got my first full-time job with benefits. It’s depressing as crap to need things and not actually be able to afford them. So whenever I get paid, and there isn’t a big bill looming around the corner, I try to build my wardrobe back up again as inexpensively as I can. I get plain t-shirts from big box retailers; they’ll do until this fall, when I’ll have to start looking at smaller-sized sweaters, though realistically, there’s not a lot of call for that kind of thing in Texas. Pants can be bought new from a number of places for relatively cheap – $15 or $20 a pair sometimes – but shopping around can get you even more bargain-y bargains. And I’m such a spendthrift when it comes to buying things for myself that I will bend over backwards to save a dollar. A month or two ago, I visited a nearby charity thrift store and browsed the overstuffed jeans racks. 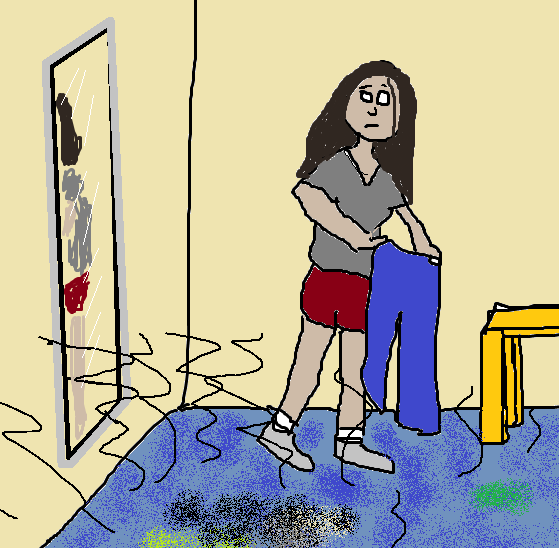 One thing I learned is that many times, the men’s and women’s jeans are jumbled together, since it can be hard to tell some of them apart once tags have been torn off, worn away, faded by time, or eaten by monsters that are nourished solely by tags, whatever. This makes finding your size sometimes hard to find if you’re used to flipping through clearly-marked sizes and tags in well-organized clothiers. 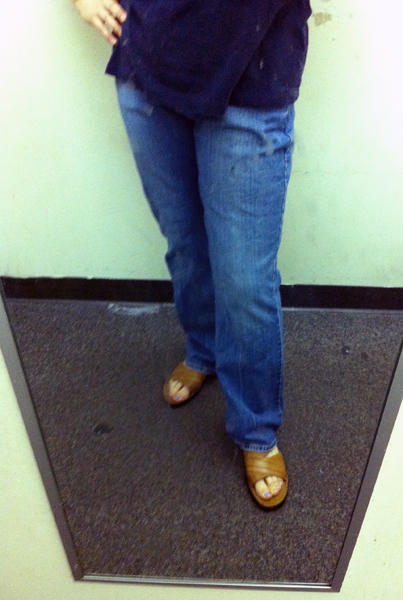 I combed through two racks of jeans and found two pair that I felt like trying on. I found others that I wanted to take pictures of to share them with the world, but I had great misgivings about whipping out my iPhone and taking Instagram photos to make fun of bedazzled, embroidered jeans in a thrift store where I was shopping for real clothes and not just Halloween costume components. 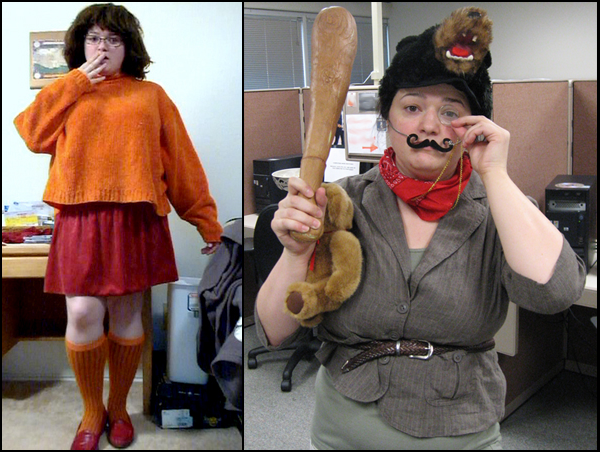 Thrift store costumes from the past several years: Velma and Teddy Bear Roosevelt. I picked up two pairs of pants that last shopping trip. One pair, I have no idea where they are. They have disappeared into the depths of my house somehow. The other pair was loose and comfortable when I tried them on. They were also way long, since I have short legs and a short inseam, but I decided against hemming them, because I knew they would probably be released back into the wild at some point, and I wanted them to be in just as good condition as they were when I bought them. Those pants are now too big. Most of my pants are too big. So I went to another thrift store this weekend on the way to the grocery and picked up two more pair of pants. The store I visited this time was a little bit cleaner and better organized, though the dressing room was still disgusting. But I got an awesome find: Levi’s for $6.00. We can re-clothe her. We have the Hamiltons. Introducing… the six-dollar pants. They had a couple of spots on them in the store, but once I took them home and ran them through the Kill All The Germs cycle in the washer, they came out looking fantastic. And I look fantastic in them. Yeah, I’ll say it. I learned to try on everything before I buy, though. I picked out a second pair of pants that had an identical waist and length (I held the jeans up together and measured them against each other, thought about that dressing room, and made a beeline for the register). The second pair is a pair of men’s pants, cut very full in the legs. But there’s this awesome long pocket up the leg that is the right size for the handle of a hammer, so if I want to become a carpenter, I’ve got a head start on my wardrobe. I also picked up a really nice belt for $2.00 so I can keep my other pants up until I can afford to discard them. This belt is leather without frills and studs, so I’ll be able to bore holes in it as needed as I continue to lose weight. If I do. I hope I do! Continuing the cycle of charity stores, I’ll be rounding up some of my old shirts, pants, and some bras (bought but never worn) to donate at some point in the near future. I’ll miss my old favorite pairs of jeans, but I’ll be happy knowing they will be looking fabulous on some other lady for a while. Thrifting can be hit-or-miss, but if you find gems and put aside any classist misgivings about pawing through other people’s things, you can come home with a real bargain. But I wonder if it wouldn’t be prudent to bring a tarp to put down on the dressing room floor. Or maybe make your own donation of a can of Lysol. This entry was posted in clothing, food, health, money, weight loss and tagged body image, cartoon, clothing, goals, money, Photos, results, weight. Bookmark the permalink.